If you think that you might have a leak in the roof of your home, then time is of the essence! The roof of the home is constructed to keep out all types of water and moisture from the inside of the home as well as to protect you from the elements. If you are seeing signs of a leak from the inside of your home, then that means that either there is a small issue in your roof that has continued for a long enough for it to finally become noticeable from the inside of your home, or something recently caused a BIG issue with your roof that created a large leak. This means that there could be all kinds of issues happening up in the roof or in the walls of your home that you are not able to see. There could be mold or fungus growing, or the integrity of your drywall in certain areas could be compromised. Either way, you want to have a professional roofer come to your home and get up on your roof to look around and diagnose it as soon as possible, before further issues continue to develop. Sometimes homeowners are not sure at what point they should call their roofing company to come out to their home. Finding a leak inside your home is an obvious sign that you need some professional help, but there are also many other ways to know that you have a problem, if you know where to look. For leaks or any kind of moisture in the home, you want to look for signs of bubbling of the paint, or color changes (water spots) in specific confined area. You may also notice bowing or warping in the drywall or the crown molding. When looking for possible leaks, you should also use your nose. Wet drywall smells…well, like wet drywall. It is not a very pleasant smell so if you start to notice any odd odors in your home, make sure you eliminate that as a possibility. Water also leads to mold and fungus growth, so if you see anything like around the ceilings, then you may have a water issue. 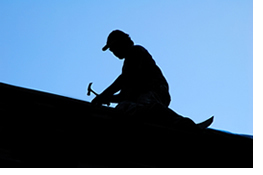 There are also other ways that you can check your roof for possible damage. If you notice that any shingles have come off of your roof, then you want to make sure that new ones are put on to replace them. If you feel brave enough to climb up on your roof, then you can do an even better inspection. Look around see if any shingles appear to be hanging on by only one or two nails (you should have at least four, one in each corner if they were properly installed.) If you see that there are a lot of shingles that have cracked or torn in half that is also a bad sign. Also check your rain gutters and see if there are small rocks or granules in them. As shingles age they lose their coating and need to be replaced.